Does the Facility Mapper warrant or guarantee accuracy or comprehensiveness of the information provided? Which sites are included on this web page? Are all the sites actually displayed on the map? How do I search the map to find sites? How do I navigate the map view? When I find my site of interest, how can I see the available details about the site? I have a question about a site, how do I contact you? How do I switch between satellite view and street map view? How can I leave you some feedback? The IDEQ Waste Management and Remediation Division Facility Mapper (Facility Mapper) serves the general public, local governments, environmental consultants and others interested in finding the location and additional details regarding remediation sites and facilities managed by regulatory programs within the Waste Remediation and Management Division. In addition the Facility Mapper provides information on which remediation sites across the state have had activity and use limitations (AUL) implemented on their property in the form of Environmental Covenants. The Facility Mapper displays remediation sites and facilities in a web-accessible map view and allows for powerful keyword searching and pan and zoom navigation to find sites of interest. Once located, the Facility Mapper provides additional feature info about each site. The feature information includes a list of programs implemented at a given site as well as basic program identification and contact information. The Facility Mapper also provides direct access to Environmental Covenant documents. The Advanced Search feature of the Facility Mapper allows the user to search the database of facilities, view facility information, create lists of search results and, if desired download a file of lists created that can be imported into a spreadsheet application. Similarly, The Radius Search feature finds all sites within a selected radius. No. The Facility Mapper is provided for informational purposes only. While IDEQ makes every effort to assure that the information provided is accurate, IDEQ makes no guarantees or warranty of the accuracy or comprehensiveness of the information provided. Over 8,000 Waste Management and Remediation Division sites and facilities exist. An attempt was made to map all the sites and facilities but DEQ records do not provide accurate location information for some sites, so approximately 600 sites have not been mapped. These unmapped sites are listed, along with the same feature information available for mapped sites. To view a listing of the sites not shown on the map, use the Advanced Search tool accessible via the link found to the right of the Location and Filter search bars. Unmapped sites can be searched using a keyword and program details can be found for a site of interest by clicking the details link. As more accurate locational information is obtained, the sites will become viewable on the map. See the Advanced Search Help page for search details. The Facility Mapper provides two search tools for finding sites, the Standard Search tool found above the map on the Home Page and the Advanced Search tool found by clicking the link located to the right of the Standard Search tool. The Standard Search tool is a powerful means for keyword searching for individual sites, using either Location keywords or Filter keywords. The Location and Filter search options are independent of each other. Location keyword searching can locate sites by address or city keywords. Filter keyword searching can use keywords such as site name or parts of a name, or with two keywords, such as site name AND city for a more refined search. Entering the keyword "covenant" into the Filter search bar will display a list of all sites and their address, for which Environmental Covenants have been issued. Select the site of interest to navigate to the site. Once at the site click, on the environmental covenant tab to view the general types of restrictions implemented in the covenant. Click on the view link to access the actual recorded covenant. See Help for additional details on keyword searching. The Advanced Search tool provides additional methods to find sites or groups of sites as well as save the results of searches. In addition to the standard filters, sites can be searched based on the regulatory program in which they are involved and whether or not their locational information is sufficient to show them on the map view or not. Once a list is created the detailed information for sites in the list can be viewed. The lists themselves can be downloaded to a CSV file which can be imported into a spreadsheet application and printed. Further, a Radius Search feature allows for finding and downloading sites within a specified radial distance. See Help for details on the use of these tools. In addition to keyword searching, various navigation tools allow users to, for example, pan, zoom, measure areas and perform other map navigation functions. These tools exist in the upper left side of the map just above the map. Placing the mouse over an icon presents a description of the function of that tool. Clicking on the tool enables that function. In any given map view, sites are shown as colored and labeled icons. The icons describe the DEQ program or programs involved with a site. 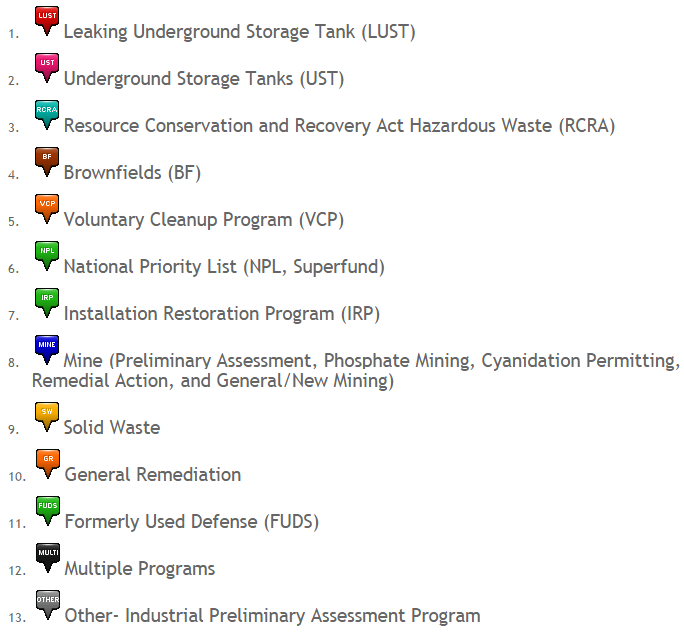 The color legend found below the map describes the DEQ program associated with each icon. The icon itself is also labeled with the acronym for that program. Certain icons are associated with multiple programs. The LUST icon describes participation of both the LUST and UST programs. The MULTI icon reflects the involvement of more than one program, apart from UST/LUST, such as the UST and RCRA programs. Finally, the OTHER icon describes sites involved with the Industrial Preliminary Assessment program. As one hovers over a given site icon the name of that site or facility appears. With the "pan" tool selected from the upper left corner, select your site of interest by left-clicking on the icon with the mouse. Doing so displays an "i" button on the selected site and shows site details in the Feature Info panel below the map. The Feature Info panel contains several tabs along the upper left of the frame which provide additional site information. The Programs tab provides information on which Waste Management and Remediation Division programs have had involvement with the site. The program is listed along with a program specific ID number and, where appropriate and available, an indication of the status of the site in that program. The status is commonly related to sites where remediation is or has taken place, such as the Voluntary Cleanup Program or the Leaking Underground Storage Tank Program. Clicking on the link for a given program takes you to the program"s DEQ webpage, where available, and provides an additional source of program information. For the Underground Storage Tank Program, clicking on the program link at a site will take the user to the IDEQ UST-LUST database detailed information for that particular facility. Selecting the Contact IDEQ tab provides the user with IDEQ staff contact person information for all the programs involved at the site as well as a general IDEQ phone number for the IDEQ Regional Office where the site is located. The final tab which occurs for selected sites where remediation took place is entitled Environmental Covenant. An environmental covenant is a legal instrument recorded on real property and governed by the Uniform Environmental Covenants Act (UECA), Chapter 30, Title 55, Idaho Code. An environmental covenant is commonly used as a component of a risk-based cleanup to control the potential risks posed by residual contamination, protect the integrity of the cleanup action, and assure continued protection of human health and the environment. See our Environmental Covenant web page for additional details. When Environmental Covenants have been recorded for sites, this tab provides general information regarding the activity and use limitations required by the Environmental Covenant and provides access to the actual document. Navigate to the site, click on the site and in the Feature Info section under the map, go to the Contact IDEQ tab. Here you find the Program Managers for the site, listed with phone number and email. You can click on the email address to launch an email to the manager. The email subject line will refer to the site, so all you need to do is enter your question or comment. Also, if specific information regarding a site is desired a public information request can be submitted to IDEQ. The Facility Mapper facilitates this by providing a link in the Map View directly to the IDEQ public information request online submittal form. The Facility Mapper defaults to a hybrid satellite imagery view which shows the terrain and streets. However, you can switch to the standard street view and toggle between street and satellite view, by selecting the blue plus sign on the top right side of the map and then clicking the appropriate radio button for the view desired. We very much appreciate your feedback as we strive to improve our map and site. Please click here to leave your feedback. Additional Questions Contact us if you have additional questions Send email. Filtering by "Mapped" and "Not Shown"
The Facility Mapper provides Standard Search, Advanced Search and Radius Search tools, each of which allows for varying degrees of keyword searching and filtering to find Facility Mapper sites of interest and, in turn, viewing sites on the Facility Mapper interactive map along with detailed site information. The Standard Search lends itself to searches for individual sites when the address or site name is known, whereas the Advanced Search can create customized lists of sites for viewing and download and also help find specific sites when address or other locational information is not known. Radius Search finds all sites within the selected radius. The Standard search includes searching for sites either by "Location" keywords or "Filter" keywords. Each type of search can be performed directly from the Facility Mapper Home page. Both the Location and Filter methods of the Standard Search allow users to type in a keyword to find lists of matching sites from which they can select a site(s) of interest and view feature information. Importantly, each search method is independent of and not connected to the other. For example, a "Filter" search does not limit its reach to the scope of results yielded by a " Location" search. In the location bar, type any partial or full street number, street name, or city name. Here are some examples of location searches. Complete Address: Enter complete address (e.g., 689 E 7th St, Weiser, ID). The search tool will list matching address and allow you to zoom to the address and, in turn, place a location pin on the address searched. Street Name and City: Enter street name and city (e.g., 7th St, Weiser, ID). The search tool will list matching addresses and allow you to zoom to the address and, in turn, place a location pin on the address searched. City Name: Enter city (e.g., Weiser, ID). The search tool will list the matching city (or cities if more than one match). You can them zoom to the center point of the city and zoom in or out or otherwise navigate as needed to see sites in and around the city. Searching with Filters allows other means to find sites using a variety of single keywords or by searching on two keywords. When searching on a single keyword, simply type any keyword of three or more characters in the Filter search box. After typing 3 or more characters, search results will show in a list, ordered by site name, for all sites that include the keyword. You can then select the site of interest from the list and place a location pin on the site selected. Here are some useful examples of single-keyword searches. Site Name:Enter the site name or part of the name (e.g., "Behrman" or "Beh" or "Exxon" or "Exx"). Environmental Covenant: Enter "covenant." The search tool will list all sites for which Environmental Covenants have been issued. ID number: Enter the complete or partial ID Number (e.g., "2011BAZ5436" or "BAZ5"). Contact Person: Enter the full or partial site-specific contact name (e.g. "Clough") to view all sites with Natalie Clough identified as the site contact. *See the FAQ under "Which sites are included on this web page?" for a list of searchable programs and associated acronyms. Searching by two keywords allows for searching first keyword AND a second keyword for a more refined search result. For example, any of the single-search keywords described above can be combined into an "AND" search. Further, any two keywords that seem useful to identify a site of interest can be combined to find sites. hERE ARE SOME examples of two-keyword searches. VCP and Covenant: "VCP and Covenant" to view a list of all sites involved with the VCP program AND for which an Environmental Covenant has been issued. City and Covenant: "Boise and Covenant" to view a list of all sites within the city of Boise or with Boise in some part of their name or address AND which have been issued an Environmental Covenant. City and Regulatory Program: "Boise and Brownfields" to view a list of Brownfield sites in Boise. City and Site Name: "Boise and Exx" to view a list of sites with Exx in their name (such as Exxon) within Boise. While Standard Searching is particularly useful for finding single sites, Advanced Searching can generate customized lists of sites based on various filters (e.g., list all brownfield sites) for viewing and download. With the various filters provided, custom lists of Facility Mapper Sites can be created to view on screen and, using the "Download CSV" link, downloaded as a CSV file that can be imported into a spreadsheet application. Additionally, a list of all sites can be created and downloaded. To do this, select "All Mapper Sites" from the Select Sites dropdown and choose "View Results" to create a list and/or download a spreadsheet of all Facility Mapper sites. Use the Select Sites dropdown list to choose the desired regulatory program under which the site was addressed, and then select "View Results" to create a Regulatory Program-specific list view. See the FAQ page for an overview of regulatory programs. Note, in some cases sites were addressed by more than one regulatory program. In these cases, the site will appear more than once. For example, a site could appear under a search for "brownfields" sites as well as a search for "underground storage tanks" sites. When a search is desired of all Facility Mapper sites it is recommended that the user first select "All Facility Mapper" from the Select Sites dropdown list and choose the "All" button from the include filter. Select the "Mapped" button to list only those sites that appear on the Facility Mapper interactive map. Select the "Not Shown" button to view sites not shown on the interactive map. As discussed on the FAQ page, DEQ records do not provide accurate location information for some sites causing approximately 600 sites to remain not mapped. Searching on "Not Shown" lists these not mapped sites. When a search of all sites (mapped and unmapped) is completed using the "All" sites button, mapped vs. unmapped sites are identified in the Mapped field of the list created. Yes indicates that the site is mapped while not_shown indicates it is not mapped. Search within the "And/Or Keyword" area by all or part of any keyword. Keyword searches will find matches for any Name, Street, City, County, or Box Number. For example, a search on "Bois" will find all sites with the word "Boise" in either the Name, Street, City, or County. Use two or more filters to refine your search. For example, search the Select Sites dropdown by "Brownfields" and the Include button on "All" and the City on "Boise" and any keyword to yield a custom list. Within any list view, select the "yes" link in the "Mapped" column to view the site on the Facility Mapper interactive map. For any site included in a list created the detailed site feature information, identical to that displayed for sites in the interactive map, can be viewed by clicking on the SiteID number associated with that site in the View Details SiteID Column. Radius Search provides the ability to find all of the Facility Mapper sites within a specified radial distance (e.g., 1/4 mile, 1/2 mile, etc.). See the FAQ page for an overview of sites included within the Facility Mapper. Radius Searching can be centered on a specific address or on more general locations, such as street names or city names. Select the Address (or more general location, e.g. street name or city name), select the Radius, and then select Search. A radius map of Facility Mapper sites will appear. Select any site within the radius for additional information. Alternatively, summary information about each Facility within the selected radius can be downloaded as a CSV file that can be opened within a spreadsheet application.